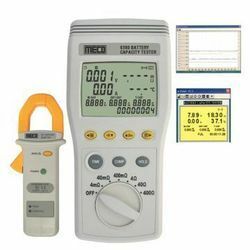 Our product range includes a wide range of meco battery tester model abm 18, meco battery capacity impedence tester model 6390, battery tester, transistor tester, torque meter and whirling phychrometer hygrometer. A battery is an electro chemical cell that is charged externally to store electrical power. The stored power of the battery is released when it is needed for various applications that could be required for normal day to day working, back-up operations, critical applications or for emergencies. The use of batteries is increasing every day in order to drive / support various applications such as Cars, Motor Cycles, UPS, Generators, Automobiles, Emergency Lights, Solar Power etc. A battery is expected to always perform flawlessly as per its capacity. 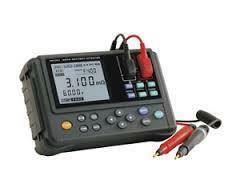 However sometimes even new batteries fail and hence periodic testing andmaintenance of batteries is required. It is important to also test incoming batteries as a part of the quality control procedure to ensure proper compliance of the supply made by the battery manufacturer. The loss of battery capacity occurs gradually often without the knowledge of the user. Motorcar batteries from 2 to 200Ah. Generally speaking, the higher the capacity of a battery, the lower the internal resistance, and in the caseof high-capacity batteries the check decision requires accurate measurement of an extremely small internal resistance of a few tens or hundreds of microohms. The 3551 has a resolution of 1μΩ, an order of magnitude finer than the 3550, and with the special-purpose 9465 PIN TYPE LEADS, provides decisionsfor high-capacity batteries. *The term "high-capacity battery" is used here to mean one with a capacity of at least 500 Ah, and internal resistance not exceeding 0.5μΩ. The operational life of a battery varies greatly, depending on the pattern of use (frequency of power failures, continuous operating time, and so forth) and also on the environmental conditions. 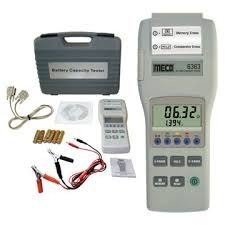 It is therefore necessary to measure the internal resistance and voltage of the battery, and also the temperature of the battery or of the environment, in order to assess the state of the battery. * Temperature measurement with the 3551 requires the optional 9460 CLIP TYPE LEADS WITH TEMPERATURE SENSOR. 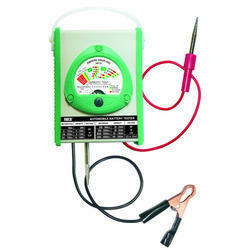 Model 3555 uses the same AC four-terminal method* as that used on Models 3550 and 3551 for testing lead-acid batteries to measure the internal resistance, and simultaneously measures the battery voltage, to give an immediate Pass/Warning/Fail result. * The AC four-terminal method supplies an AC current from the source terminals to the battery being tested and measures the voltage drop with the sense terminals. This cancels out the contact resistance andlead resistance, and provides accurate measurement of low resistances. See also the enlarged illustration of the tip of the 9461 Pin-Type Leads. The Pass/Warning/Fail assessment of a battery's state is based on a six-way combination of comparisons*against upper and lower resistance limits and a voltage threshold. This result is then indicated by LED sand a beeper. For a UPS in a hospital or computing facility, where a break in the supply cannot be tolerated, battery maintenance must be carried out with the battery live. Models 3550 and 3551 are designed to be able totake measurements even while the battery is being charged. 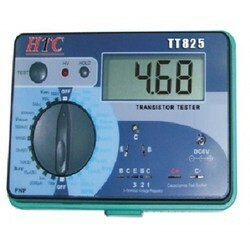 * The tester includes circuitry to attenuate noise at frequencies other than the measurement frequency(1 kHz). If, however, noise is present at close to the measurement frequency, a stable reading may notbe obtained. A UPS consists of a number of cells connected either in series or parallel, and data for each of these cellsmust be obtained rapidly, and recorded. 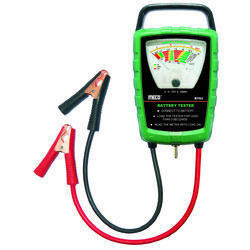 The BATTERY HiTESTERs have a built-in internal memory function which retains the measurement values and the decision result: Model 3550 holds 260 sets ofdata, and Model 3551 holds 250 sets. These can be recalled on the tester itself, or can be printed together with statistics, using the optional 9203 DIGITAL PRINTER. 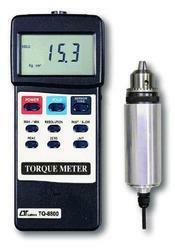 Professional torque meter with15 Kg-cm torque probe, full set. A battery is expected to always perform flawlessly as per its capacity. However sometimes even new batteries fail and hence periodic testing and maintenance of batteries is required. It is important to also test incoming batteries as a part of the quality control procedure to ensure proper compliance of the supply made by the battery manufacturer. The loss of battery capacity occurs gradually often without the knowledge of the user. capacity condition of different types of batteries from 4 to 500Ah. (Green), 'WEAK' (Yellow) and 'BAD' (Red) directly. Comparator Output : LCD display of PASS, WARNING, or FAIL. Select beeper to sound on PASS/WARNING or FAIL. Failure of high voltage power apparatus costs lost time, lost revenue, un expected maintenance and repair costs. These could have been minimized with a optimum test program.UDEY CDF-6000 provides the most accurate test results for power apparatus. CDF-6000 incorporates breakthrough technology and design that gives accurate and reliable results, again and again. Can re call stored 99 tests results. Automatic calendar and time running. The entire test is done automatically and quickly. Operator enters the test parameters and UDEY CDF-6000 takes over; powers up the voltage, balances the bridge, takes the readings, ramps down to zero and displays the results on the LCD screen. Prints results through its built-in printer. A key feature of the CDF-6000 is its advanced interference suppression circuit based on the principle of line frequency modulation. 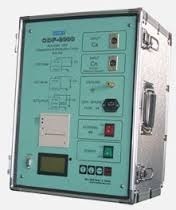 The operator sets the CDF-6000 to take measurements at frequencies above and below the line frequency to cancel out the effects of interference caused by the high voltage lines. Accurate measurements are made in even in energized switch yards up to 765 kV. Test capacitance range @ 50 Hz / 60Hz. Also displays the phase angle, frequency, watts loss, insulation power factor or tan delta, resistance (in the case of resistive specimens), inductance and quality factor (in the case of inductive specimens). The CDF-6000 is equipped with self-diagnostic procedures,protection against short circuits, open and poor ground connection, input over-voltage and audible sound, flashing light indicators during test. 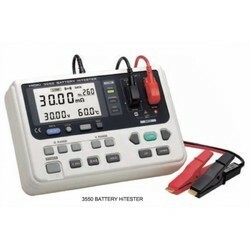 Looking for Battery Tester ?